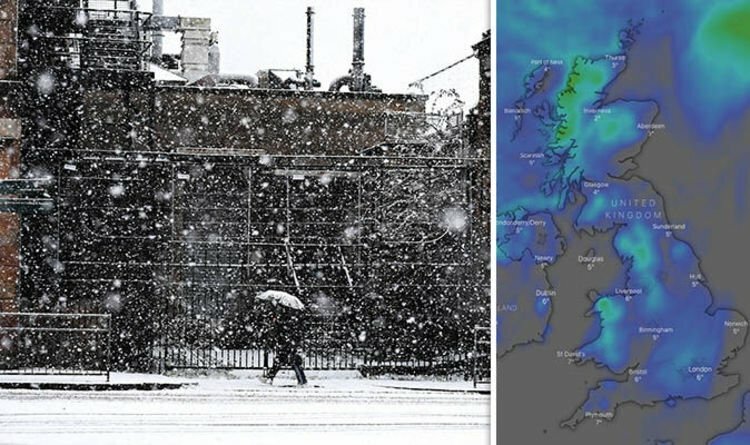 Met Office weather forecasts are showing snow is now well and truly on the horizon, as the major snow from the north descens on the south. The latest maps show the limited flurries could become much heavier. Yellow warnings have been laid down by the weather service, which are indicative of potentially dangerous conditions as the mid week approaches. Yesterday’s temperatures peaked around 6C in southern parts as Britain shivered. A yellow warning for wind was in place across much of the east coast until 9pm on Sunday night, with the Met Office warning of power outages and heavy seas. Wind gusts of up to 70mph are expected along the coast, with 60mph blasting inland regions of the east. Overnight and into Monday morning, temperatures plummeted further, with northern areas down to below zero, and the south barely cracking two degrees. Snowfall has taken to much of the country this morning, mainly in the west, with Wales, the Midlands and Western Scotland/Northern Ireland seeing the deepest. From Aberystwyth to Bangor and just East of Lancaster will see the deepest in the UK, and south of Ballyshannon in Ireland. The far north in Scotland has also seen freezing conditions, as ice becomes a danger this morning. The Met Office says a yellow warning for ice is in place from 3.14am until 12pm today. Snow will fall across much of Northern Ireland, moving into western Britain as the day rolls on, the Met Office said. But the heaviest snow is expected to start falling on tomorrow, with widespread disruptions expected. The Met Office has issued a yellow alert for snow, stretching from Kent and East Anglia, up to Lincolnshire, the Midlands and almost as far across as Bristol. The alert is in place between 9pm on Tuesday and 12pm on Wednesday, with up to 10cm of snow accumulating on high ground. Accumulations of up to 3cm of snow are likely quite widely, with accumulations of 5cm in places. Residents are urged to plan ahead, as the snow could cause disruptions for roads, rail and air travel. The warning also said “there is a slight chance that some rural communities could become cut off”, and “there is a small chance that power cuts will occur and other services, such as mobile phone coverage, may be affected”. Sky News weather presenter Kirsty McCabe said: "The weather will be cold and unsettled this week with a messy mix of rain, snow and ice. "During Tuesday evening a band of rain pushing east across parts of England is likely to turn to snow, with up to 10cm of snow possible over the hills of central and southern England. "The snow risk will continue into Wednesday with many places seeing accumulations of a few centimetres. "As always with snow forecasting, the details will be tricky, especially for the London area. "However, even a small amount of snow or ice could lead to travel disruption."